A LEED-certified middle school in North Carolina that opened in 2013 has gone public with one aspect of its approach to energy efficiency. Sandy Grove Middle School is anticipated to save about $16 million on the energy bills for Hoke County Schools over the 40-years lifetime of the school building. LEED, an acronym for Leadership in Energy and Environmental Design, is a suite of rating systems, certified by the United States Green Building Council, to measure sustainable building design, construction and operation. When Sandy Grove opened in August 2013, it claimed to be the "first net-positive energy, LEED platinum designed, leased public school" in the country. The facility included 2,300 solar panels, which generate more power than the 76,000-square-foot school consumes; a geothermal system that uses ground temperature as a heating and cooling source; energy-efficient heating, ventilation and air conditioning (HVAC); and LED lighting. It was that last item that almost didn't make it on the list. According to Barry Buckman, a principal with architectural firm SfL+a Architects, the project originally was designed around traditional fluorescents. "LED was just emerging in the market but we didn't think it was viable from a cost standpoint," he said in a case study on the project. Cree, which sells lighting products, showed up at an opportune moment during the construction process and did an energy analysis with its LED fixtures to show what the savings could be. As Buckman explained, "LED is an important aspect in that it's just a very energy-efficient light fixture, so you're using less power to handle what your typical lighting loads are going to be." About 80 percent of the school's lighting ended up being delivered with LED fixtures. The lighting savings were multiplied in the area of maintenance and HVAC. Because LED lights last longer than traditional fixtures, they don't need to be replaced as often. That in turn led to more design flexibility, noted Buckman; the lights could be placed higher in the rooms. "The ability to put lighting up high is something we wouldn't have considered before from a maintenance and access standpoint — too much kickback from the maintenance department." 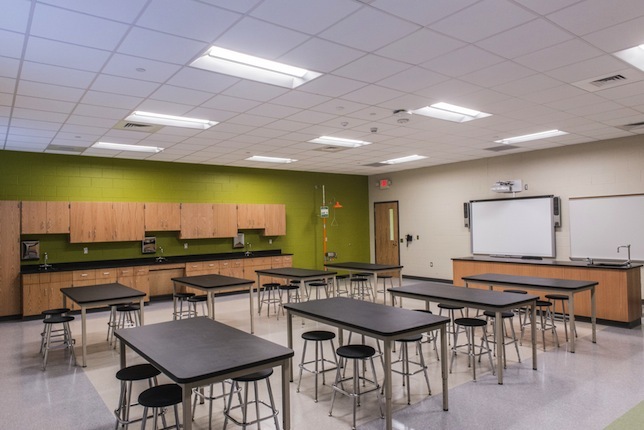 Because the fixtures don't heat up as much, the school had benefits in terms of its HVAC sizing and heat load, he added, "making LED attractive beyond just the initial energy usage benefit." On top of those advantages, the school incorporates an automation system to control building systems. That includes dashboards to report on energy usage. The use of those is integrated into the school's STEM-focused curriculum. The school was built through a public-private partnership. Developer Firstfloor K-12 Solutions leases the land from the county and owns the building, which it leases back to the school system. Firstfloor is a "sister company" with SFL+A and has built several other schools and university buildings in North Carolina.